The Climate Suit. I like the versatility of the suit. You can easily remove the softshell jacket liner and the Thermadex insulation in the bibs. The jacket has waterproof zipper on the outer shell so I'm always warm and dry while wearing this suit. This insures that the rest of my gear will be dry as well. I also like the Shak shirt and Shak pant. I enjoy wearing these under my climate suit or just by themselves in a permanent shack. They are very warm and comfortable. I like that they are made of non-pilling and moisture wicking material. Drill more ice holes than what you think are enough. Don’t limit yourself to 8-10 inches out of the entire lake. By drilling multiple holes, you are giving yourself the opportunity to move with the fish. The fish don’t stay still all day, why should you. Drilling the holes early will prevent you from spooking the fish later. By following this tip, you will catch more fish. I grew up fishing with my dad, grandpa and twin brother. I started fishing from the rocks on Lake Ashtabula in North Dakota. Being outside fishing with family and trying to get that next personal best is what made me fall in love with fishing. Ice fishing just made my passion for fishing even better. The thrill of finding some nice fish and catching them through an eight-inch hole is awesome. 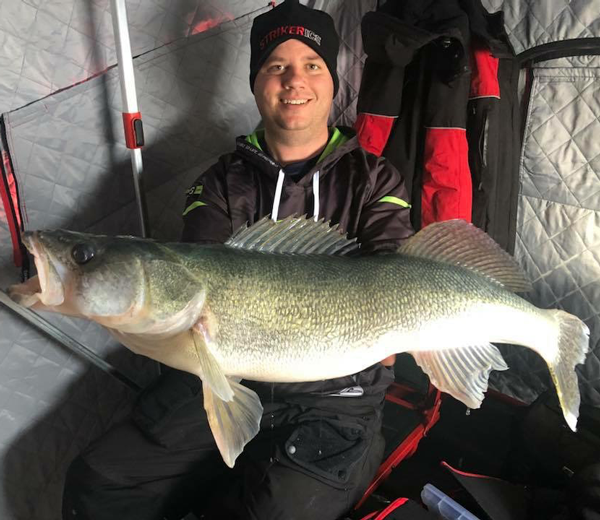 I find ice fishing to be more challenging because you are limited to eight inches of the lake at a time; there’s something cool about that.